When Spring has sprung, so do Ponchatoula Strawberries. This is a great salad recipe from my friend Brenda. We had dinner parties when we were all newlyweds. I've made it every year when the strawberries are ripe and delicious! 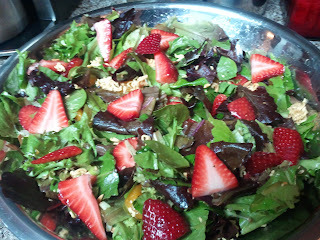 You can use any lettuce you like for this salad; baby greens are nice with this also. I have tried it with iceberg and I don’t think it tasted as good.